Breathe Deeply, Inhale the Eternal Breath. I first posted this prayer a couple of years ago and it is still one of my favorites. 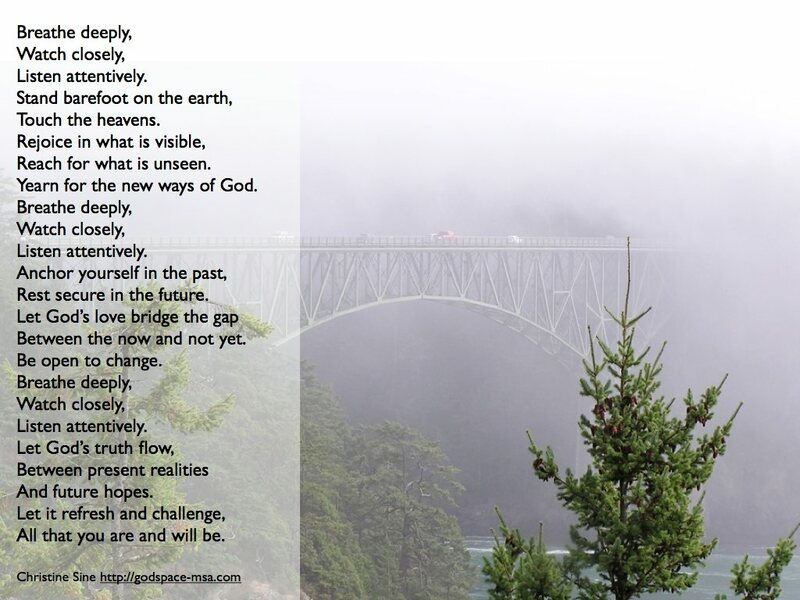 I used it as the prayer for one of the reflections in Rest in the Moment– which can be downloaded from the Godspace store or purchased from Amazon. I also love the meditation that I put together in conjunction with it and have found myself enjoying the sound of water and the words I wrote once more. One thing my life coach suggested a couple of years ago is that I reward my weekly progress with a fun project that energizes and renews me. This project was one such project and I always feel that something like this is a God given gift to me and hopefully to others too. I hope you enjoy it too. I suggest that you sit still, close your eyes and allow the sound of the words and the running water in the background to sooth your spirit. I deliberately did not include the words on this video as it is intended to encourage us to relax into the presence of God, something which is more challenging when we read along as our focus is on the words rather than on God. Imagine it rushing into your lungs. Allow it to course through your entire being. See it infused into every cell in your body. On the earth beneath your feet. Uniquely shaped by your Master’s hands. Stewards of God’s good creation. To inner wholeness and outer response. Love, compassion caring, generosity and justice. Was Jesus Name an Affront to the Jews? Following Jesus – What Difference Does it Make?